I keep mentioning that harvest is close to being over. Well, I think we are finally done! One meal that is easy to make in the Pressure Cooker, or Instant Pot, is Spaghetti. I felt like I was really going out of my comfort zone, but this is so much more convenient. This picture was taken on one of the last evenings I worked late at the elevator. Beautiful colors in the sky, and it was transferred right over to the camera. We are still looking for simple dinners. Sports is keeping us busy in the evenings. I don't know if I want to admit it, or I am proud to admit it, but we love spaghetti. We can eat spaghetti once a week! It's a simple dinner to throw together. There are so many options with the different types of pasta available, but the angel hair pasta is our favorite. Brown one pound of hamburger and one pound of ground pork with a chopped onion You can do two pounds of hamburger if you want to. There is a brown option on the pressure cooker, but I did this step on the stove. Add one box of angel hair pasta over the hamburger. Add jar of spaghetti sauce, one can of traditional spaghetti sauce, one small can of tomato paste, and one cup of water. Lock on the lid, set pressure cooker for 15 minutes. When 15 minute timer is up, push on valve and release. Watch for steam. Remove lid, and this is what it looks like. Immediately stir spaghetti and serve! 5. 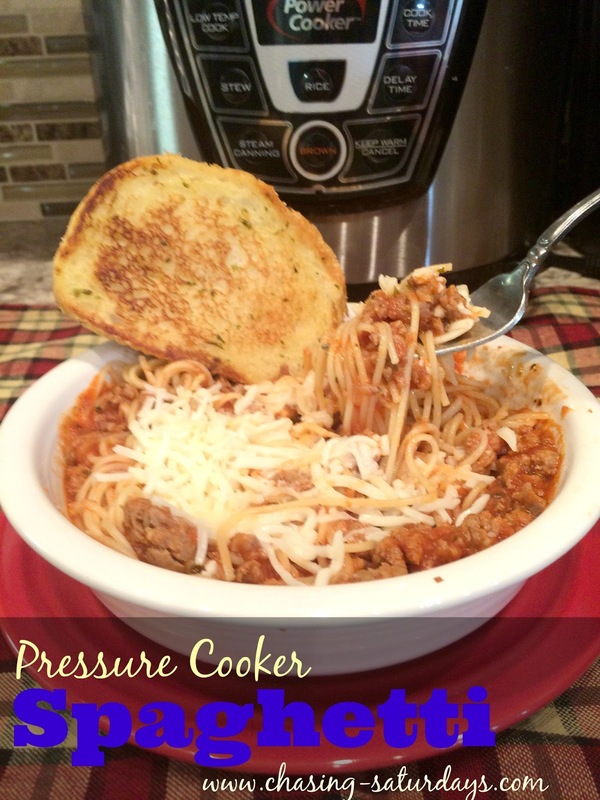 Set pressure cooker for 15 minutes. We could easily have this once a week, and leftovers are delicious! This look so yummy! I have seen that new pressure cooker at Costco and I have been debating whether to get one or not. After seeing your spaghetti dish, I think you have made my mind up for me! Promise me you will pester me until I take my Insta Pot out of its box! It's been sitting in the office way too long! My father love to cook Spaghetti on the day when my Mom is not at home. He gathers various vegetvles and make mixture with chicken to make his spaghetti appetizing and delicous. I need more tried and true recipes. Help! Am cooking some pasta for the first time in my power pressure cooker. Will see how it comes out.